Baby food can be expensive and, sometimes, of somewhat dubious content. Do you really want your baby eating cornstarch, often used as a thickener, as a first food? I admit that having a jar or two of ready made* on hand is convenient in a pinch, but making your own baby food is easy, healthy and frugal. My favorite method is to cook a smallish quantity of a vegetable until it is soft, drain off the water and then mix using a hand mixer. I then freeze it in a covered ice-cube tray; when frozen solid I transfer the cubes to a plastic container and label with the vegetable name as well as the date I prepared it. This method takes very little time and I often make a batch of food while cooking dinner. In my freezer I have four or five different varieties of cooked vegetables at any one time. Babies also love fresh fruits and vegetables, thoroughly mashed. Avocados and bananas are classic first foods. Sometimes I cube fresh fruit, freeze and then pop the frozen chunks in a mesh baby feeder. This makes a great, if messy, teether- do before a bath not after! What to do with leftover baby food? 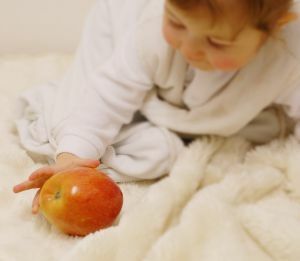 It is widely recommended not to save and reserve any food from which you were feeding your baby as the saliva transfered from the spoon to the bowl is a ripe breeding ground for various nasty bugs. Instead you should put in the bowl only the amount you are planning on feeding immediately. But babies are notoriously unpredictable creatures and I almost never judge correctly how much my daughter will eat. So I place the bowl with the leftover food directly into the freezer and then, once it has frozen solid, I can pop the food out and put it in a plastic container. These remnants are saved to thicken soup, for vegetables, or added to cake, for fruits. I feel comfortable doing so, because I know what’s in them– I made them myself. An excellent resource for all things baby food related is Super Baby Food by Ruth Yaron. It is full of recipes and meal ideas as well as advice on when to start different foods. *I do love French baby food. Take a look at these ingredient lists. For a jar of Potato and Leek mix the ingrediants are: potatoes, leeks, carrots and parsley. For a jar of Artichoke mix the ingrediants are: potatoes, onions, corn, broccoli, artichokes and parsley. For a jar of Mixed Vegetables the ingrediants are: carrots, potatoes, leeks, celery, cream, rice flour, tomato paste and salt. No wonder their palates are so much more refined than ours! So true, as a nanny I made all the babies food, homemade, healthy, cheap and enjoyable!